Soft shades of pretty painted confetti are tossed lightly on this breezy, romantic style. Its soft colors are gently painted with broad watercolor brushstrokes. 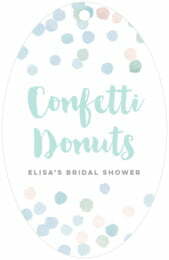 Sweetly carefree with a touch of whimsy, Watercolor Confetti is especially lovely as a wedding or shower invitation - and a fun choice for birthday parties. We also love it used as a label for scented products and gift desserts. Customize your Watercolor Confetti bath and body tags today! Watercolor Confetti bath and body tags are printed on one side and are blank white on the back. You have the option to add text on the back for a small charge—just ask! Bath and body tags are printed on extra-thick cover weight white paper and come in a variety of shapes and sizes, including square, circle, heart, a scallop-edged circle, ovals, and other shapes. Bath and body tags come pre-punched with a small round hole to thread your choice of tying material. They are punched out individually and packaged as a set in small bags. 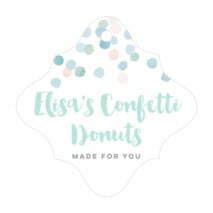 Just choose a shape from above and then select "Personalize" to create your custom Watercolor Confetti bath and body tags.